YOU ARE ALLOWED 3 DAYS TO COMPLETE THIS ASSIGNMENT. 1. 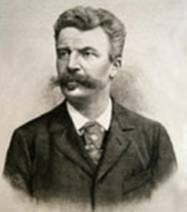 Read the biography of Guy de Maupassant below. 2. Click here for the Review Analysis Questions. 3. Click here to read the story, "The Necklace"
French author of the naturalistic school that is generally considered the greatest French short story writer. Maupassant took the subjects for his pessimistic stories and novels chiefly from the Norman peasant life, the Franco-Prussian War, the behavior of the bourgeoisie, and the fashionable life of Paris. During his last years of life Maupassant suffered from mental illness. Guy de Maupassant was probably born at the Château de Miromesniel, Dieppe. His paternal ancestors were noble, and his maternal grandfather, Paul Le Poittevin, was Gustave Flaubert's godfather. His parents separated when he was 11 years old. Maupassant grew up in his native Normandy. The gift of a photographic memory enabled him to gather a storehouse of information, which later helped him in his stories about the Norman people. In his teens Maupassant was shown, by the poet Algernon Swinburne (1837-1909), a mummified hand. He used this haunting image in his early short story 'La Main Ecorchée (1875). In 1869 Maupassant started to study law in Paris, but soon, at age 20, he volunteered to serve in the army during Franco-Prussian War. After his return to Paris, Maupassant joined the literary circle of Gustave Flaubert. He was a friend of Maupassant's mother's friend, and introduced him to some of the leading writers, among them Émile Zola, Ivan Turgenev, and Henry James. From Flaubert, who was obsessed with the writer's craft, Maupassant learned the exactness and accuracy of observations, and balance and precision of style. Between the years 1872 and 1880 Maupassant was a civil servant, first at the ministry of maritime affairs, then at the ministry of education. As a poet Maupassant made his debut with DES VERS (1880). In the same year he published in the anthology Soirées de Medan (1880), edited by E. Zola, his masterpiece, BOULE DE SUIF (Ball of Fat, 1880). The story is set during the Franco-Prussian War. A well-known prostitute, nicknamed 'Boule de Suif', is traveling in a coach with bourgeois fellow passengers. They are detained by a Prussian officer who will not allow the coach to proceed until Boule de Suif gives her to him, which she refuses on principle to do.Later the story inspired John Ford's film Stagecoach (1945). During the 1880s Maupassant created some 300 short stories, six novels, three travel books, and one volume of verse. In tone, his tales were marked by objectivity, highly controlled style, and sometimes sheer comedy. Usually they were built around simple episodes from everyday life, which revealed the hidden sides of people. On several occasions were narrated in the first person or were tales told by a named character. In 'The Jewels of M. Lantin' the chief clerk of the Minister of the Interior, marries the daughter of a provincial tax collector. He is unbelievably happy. She has only two small vices - her love of the theater and her passion for artificial jewels. One wintry evening she comes from the opera shivering with cold and a week later she dies. Lantin is haunted by his memories, and plunges into poverty. He takes her necklace to a jeweler who tells that it is very valuable. Lantin has believed that his wife's jewelry were fakes because she could not have purchased valuable items. He realizes that they were gifts and the truth makes him weep bitterly. "As he walked along, Lantin said to himself, "How easy it is to be happy when you're rich! With money you can even shake off your sorrows; you can go or stay as you please! You can travel and amuse yourself." He sells her jewelry, resigns from his work, and enjoys the theater for the first time in his life. "Six months later he married. His second wife was a most worthy woman, but rather difficult. She made his life unbearable." Among Maupassant's best know books is UNE VIE (A Woman's Life, 1883), about the frustrating existence of a Norman wife, BEL-AMI (1885), which depicts an unscrupulous journalist. PIERRE ET JEAN (1888) was a psychological study of two brothers. The novel was thought to be immoral because the hero succeeds by doing wrong. Maupassant's most upsetting horror story, LE HORLA (1887), was about madness and suicide. The nameless protagonist is perhaps a syphilitic. In the beginning of the story the narrator - a prosperous young Norman gentleman - sees a Brazilian three-master boat flow by his house. He salutes it and the gesture evidently summons the Horla, and invisible being. The Horlas are cousins of the vampires and their advent means that the reign of man is over. Our narrator eventually sets fire to his own house, to destroy his Horla, but his servants die in the fire. He realizes that his Horla is still alive and decides to kill himself. Maupassant had suffered from his 20s from syphilis. The disease later caused increasing mental disorder - also seen in his nightmarish stories, which have much in common with Edgar Allan Poe's supernatural visions. Critics have charted Maupassant's developing illness through his semi-autobiographical stories of abnormal psychology, but the theme of mental disorder is present in his first collection, LA MAISON TELLIER (1881), published at the height of his health. Maupassant's horror fiction consists of some 39 stories, only a tenth of his total. Recurring theme in these is madness: 'A Night in Paris' is a paranoid nightmare: its narrator feels compelled to walk the streets, in 'Who Knows?' the narrator sufferers from delusions about the furniture of his house, 'A Madman' is a story about a judge, who commits murder, just for the experience, and condemns an innocent man to death for the crime. 'The Inn' has many similarities with Stephen King's famous novel, The Shining. Maupassant describes two caretakers, living in the French Alps in a remote inn, which is surrounded by snow six months and unreachable. When the older caretaker goes missing, the younger in his loneliness loses his reason. 'The Hand', about a severed human hand which, despite chained up, escapes and strangles its owner, has inspired several writers and movie directors (1946, dir. by Robert Florey; 1960, dir. by Henry Cass; 1981, dir. by Oliver Stone, from the novel The Lizard's Tail). On January 2, in 1892, Maupassant tried to commit suicide by cutting his throat and was committed to the celebrated private asylum of Dr. Esprit Blanche at Passy, in Paris, where he died next year. It is claimed that all his fiction came from his own experience. Although he probably fictionalized true occurrences or tales told to him, Maupassant's style has been imitated by countless writers and his influence can be seen on such masters of the short story as W. Somerset Maugham and O. Henry.